The Association for Corporate Growth (ACG) was in its 50th year, yet it had not generated strong awareness within either the financial/M&A communities or with prospective members. Internally, members were focused on their local chapters and understood little about the association’s global accomplishments and network. ACG launched a program to revitalize its brand and reposition ACG as the premier association involved in corporate growth on an international scale. 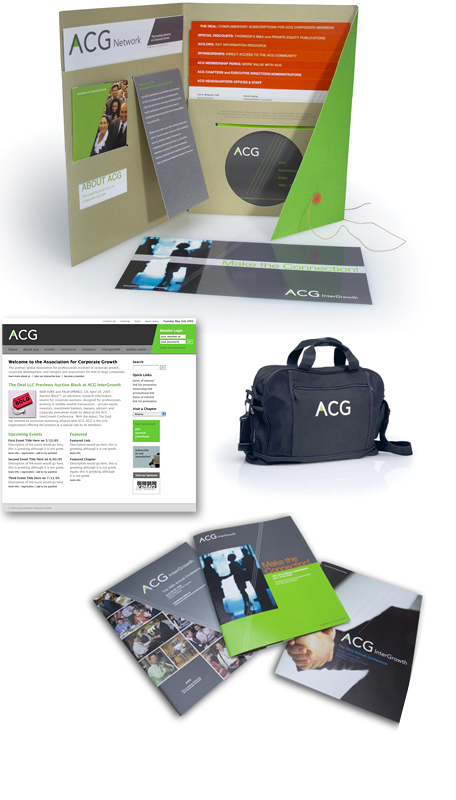 Based on a thorough analysis of current and desired perceptions of ACG, a new brand platform, brand architecture, visual identity, design system and complete brand guidelines/training program were created. The brand was launched as the centerpiece of its worldwide InterGrowth Conference and released internationally with a series of digital training sessions for each region around the world. Since the successful launch of the brand, ACG membership has grown to 53 chapters and 12,000+ members worldwide.